Champion mare Winx warmed up for her return to the race track in the Group 2 $250,000 Apollo Stakes (1400m) at Randwick next Saturday with an electrifying gallop at Randwick this morning. Winx, above, is in fine shape to return to the race track in the 2019 Apollo Stakes at Randwick. Photo by Ultimate Racing Photos. Regular rider Huge Bowman rode Winx who was matched up against her stablemate Egg Tart in a specially convened gallop on the course proper and the world’s number one race horse warmed up the afterburners to claim victory at the end of the hit out. Bowman said that he could feel the mare’s mighty engine roaring but didn’t push the throttle to full as Winx went through her gears down the Randwick straight. “I hadn’t felt that will to go and attack the line this preparation until this morning because she’s done all her work on her own at Rosehill. Winx will be chasing her thirtieth straight win when she lines up in the Apollo Stakes in a weeks time and has pleased trainer Chris Waller and Bowman in her preparation for her final racing campaign which included two Rosehill barrier trials. Winx will be having her first run back since making history with her fourth straight win in the Group 1 $5m Ladbrokes Cox Plate (2040m) at The Valley during the 2018 Melbourne Spring Carnival and Waller has mapped out a 2019 Sydney Autumn Carnival program that could see the mighty mare have her farewell appearance when she attempts to win three successive Group 1 $4m Longines Queen Elizabeth Stakes (2000m) at Randwick on April 13. 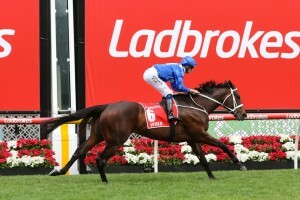 Winx is marked at $1.10 at Ladbrokes.com.au to win her third Apollo Stakes while in early Queen Elizabeth Stakes betting she is the $1.20 favourite. Winx is the winner of thirty-three of her thirty-nine starts which includes twenty-two Group 1 wins among her latest twenty-nine consecutive victories. The post Winx warms up with afterburners in Exhibition gallop before 2019 Apollo Stakes appeared first on HorseRacing.com.au.